Evidence for flossing is "weak, very unreliable" and of "very low" quality, investigation suggests, despite being recommended by numerous dental associations. The hygienist's advice to floss daily to prevent gum disease lacks hard evidence of benefits, a new investigation suggests. The U.S. government has recommended flossing for decades. It was included in the 2010 Dietary Guidelines for Americans, which stated: "A combined approach of reducing the amount of time sugars and starches are in the mouth, drinking fluoridated water, and brushing and flossing teeth, is the most effective way to reduce dental caries." In the 2015 version, that recommendation is no longer included. Under U.S. law, the guidelines must be based on scientific evidence. The Associated Press used a Freedom of Information Act request to ask for the evidence. In a letter to AP, the U.S. government acknowledged the effectiveness of flossing had never been researched. The news agency looked at the most recent rigorous research, focusing on 25 studies that generally compared the use of a toothbrush with the combination of toothbrushes and floss. The findings? The evidence for flossing is "weak, very unreliable," of "very low" quality, and carries "a moderate to large potential for bias." A 2015 review published in the Journal of Clinical Periodontology also concluded "the majority of available studies fail to demonstrate that flossing is generally effective in plaque removal." Professional groups such as the American Dental Association (ADA) and the American Academy of Periodontology, which includes specialists in gum disease and implants, cited other studies as proof of their claims that flossing prevents plaque buildup, early gum inflammation called gingivitis and tooth decay. Most research used outdated methods or tested few people. The Canadian Dental Association's website calls brushing and flossing the two most important ways to care for your teeth. "If you don't floss, you are missing more than one-third of your tooth surface. Plaque is the main cause of gum disease. It is an invisible bacterial film that develops on your teeth every day." Periodontist Dr. Romanita Ghilzon is an associate professor in the dental faculty at the University of Toronto. "I would say if you know how to floss I would continue just in case it does make a difference," Ghilzon said. For those with periodontal disease, Ghilzon continues to recommend flossing. Dr. Larry Levin said he's seen the value of flossing over more than four decades of dentistry practice in Hamilton. 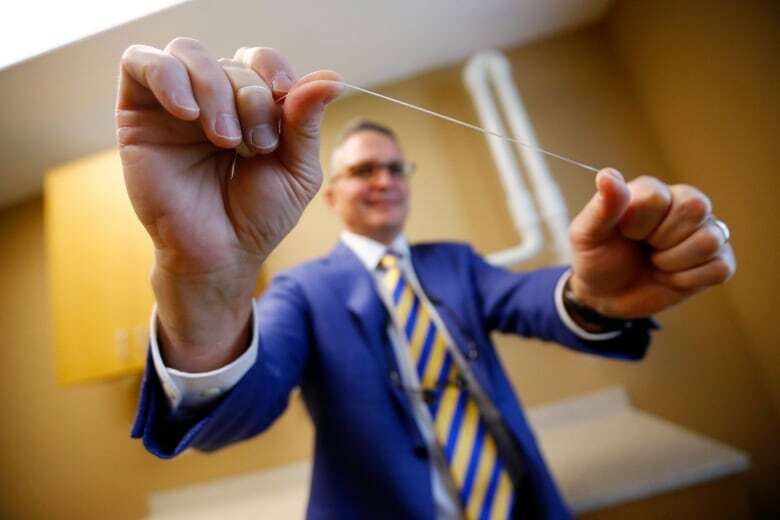 "Flossing is the only material that will fit right in between two tight teeth and it will go in between to clean them," said Levin, vice-president of the Canadian Dental Association. Flossing is part of the overall regimen for oral health, but other factors contribute, Levin said. The amount of sugar in your diet, the strength of enamel, genetics and whether you grew up drinking fluoridated water also make a difference. Wayne Aldredge, president of the American Academy of Periodontology, acknowledged the weak scientific evidence. Still, he urges his patients to floss to help avoid gum disease. "It's like building a house and not painting two sides of it," he said. "Ultimately those two sides are going to rot away quicker." Many people also use floss incorrectly, Aldredge said, moving it in a sawing motion instead of up and down the sides of the teeth. In a later statement to the AP, the ADA said flossing "removes plaque" and "is proven to help remove" debris from between teeth. 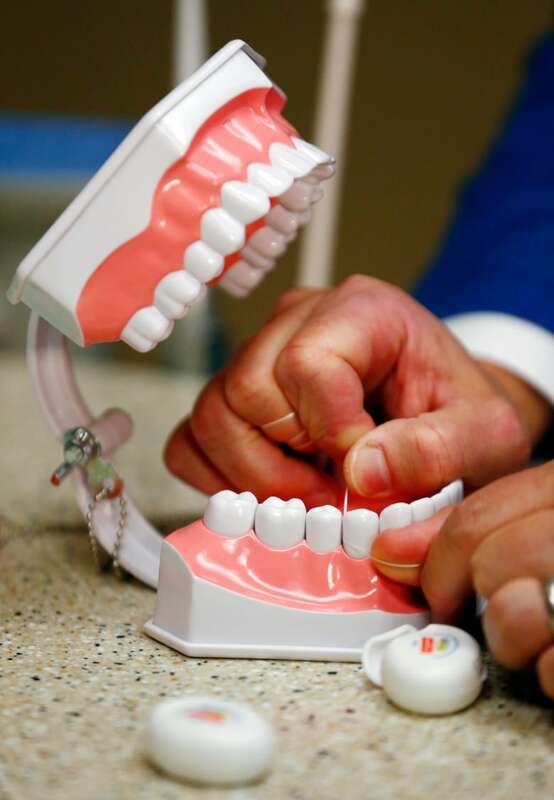 A video on ADA's website proclaims that flossing "helps prevent gum disease." When pressed, Matthew J. Messina, a dentist and spokesman for the U.S. dental association, acknowledged weak evidence, but he blamed research participants who didn't floss correctly. The U.S. National Institutes of Health dentist Tim Iafolla acknowledged that if the highest standards of evidence were applied "then it would be appropriate to drop the floss guidelines." Despite the lack of quality evidence, Iafolla continues to recommend flossing. "It's low risk, low cost," he said. "We know there's a possibility that it works, so we feel comfortable telling people to go ahead and do it." Damien Walmsley, scientific adviser to the British Dental Association, disagrees. "It's important to tell people to do the basics. Flossing is not part of the basics." Flossing is also difficult to research. For instance, people also tend to take better care of their teeth when they know someone is watching. Several observational studies have linked gum disease to illnesses such as kidney disease, diabetes, and heart disease. Since the research hasn't randomly assigned people to experimentally prove whether one causes the other, investigators are only able to say there seems to be some kind of an association between the two.